Not here until next year! 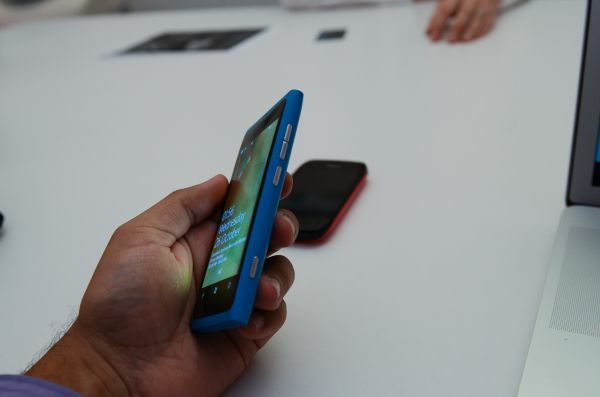 Just seven months after announcing its intention to move to Windows Phone, Nokia unveiled its first WP based devices: the Lumia 800 and 710. Both feature the same Qualcomm applications processor: a single-core Snapdragon S2 MSM8255 running at 1.4GHz with 512MB of memory on-package. The 800 has a more expensive chassis and Carl Zeiss optics, while the 710 is cost reduced in those aspects. The 800 features a 3.7-inch AMOLED (RGBG PenTile) display, 16GB of integrated NAND (no microSD slot) and a 5.365Wh battery. The 800's camera has an 8MP sensor with a Carl Zeiss f/2.2 lens. The camera sensor and lens stack are borrowed from the N9, one of the ways Nokia was able to bring the 800 to market in such a short time after the Microsoft announcement. I played with the 800 a bit at Nokia World and the feel is easily leaps and bounds beyond any WP devices available today. The 800 will be available in three colors (black, magenta and cyan) while the 710 comes in black and white. The 710 keeps the screen size the same (3.7-inches) but moves to a standard TFT-LCD. The 710 has the same amount of DRAM as the 800 but it cuts NAND in half to 8GB. Unlike the 800 however the 710 features a microSD card slot that can accommodate up to a 16GB card (24GB total). Battery capacity drops to 4.81Wh. Both models use micro-SIMs.